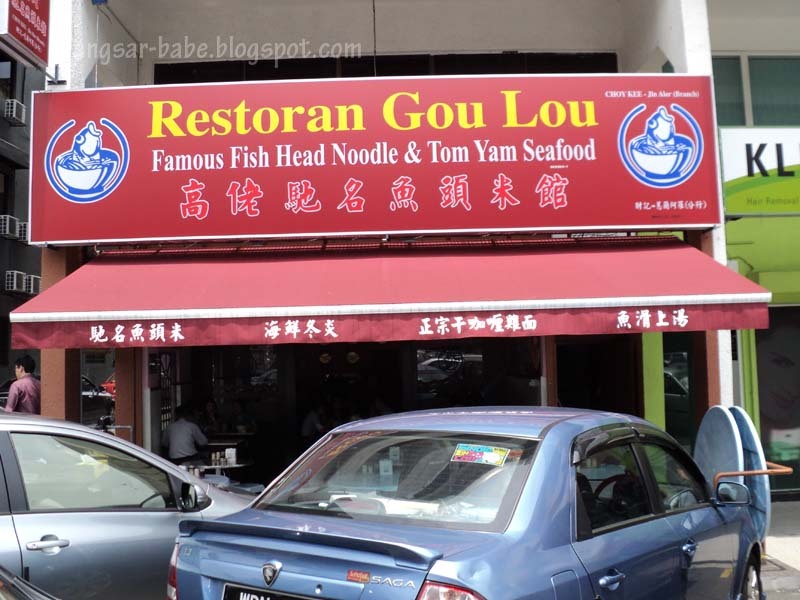 Restoran Gou Lou recently opened in Damansara Utama, and is located along the same row as Fusion, Sukico Hainan Cafe and Jin Xuan Hong Kong. Their main highlight is the Fish Head Noodles and Tom Yam Seafood Noodles, but Curry Noodles is also available. rif and I got there early and got ourselves a nice table at the corner, right under the air-conditioning. The waiters use a palm top to take your orders, instead of the traditional pen and paper. I found this way quite systematic. I ordered the Fish Head Noodles (RM7.50), and changed my vermicelli to thick bee hoon (additional RM0.50). 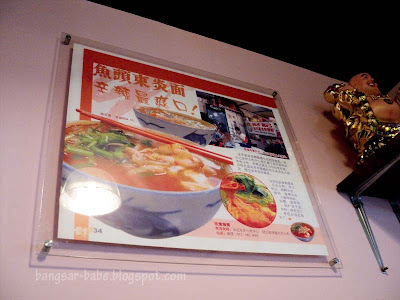 rif had the Seafood Tom Yam Noodles (RM8.50) with thick bee hoon. Our noodles took approximately 15 minutes to arrive, and by then, the lunch crowd started trickling in. 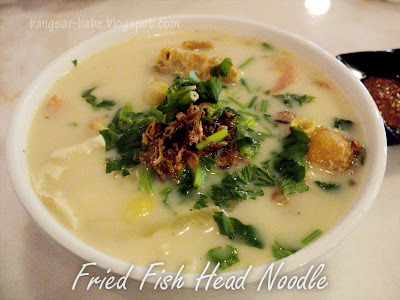 My Fish Head Noodles came with generous chunks of fried fish, preserved vegetables (ham choi) and tomatoes . The soup was milky, slightly sweetish and fragrant from the addition of rice wine, parsley and shallots. I found the noodles quite good, but not the best I’ve tasted. The chili sauce could have been spicier and more pungent — it was a tad too mild for me. 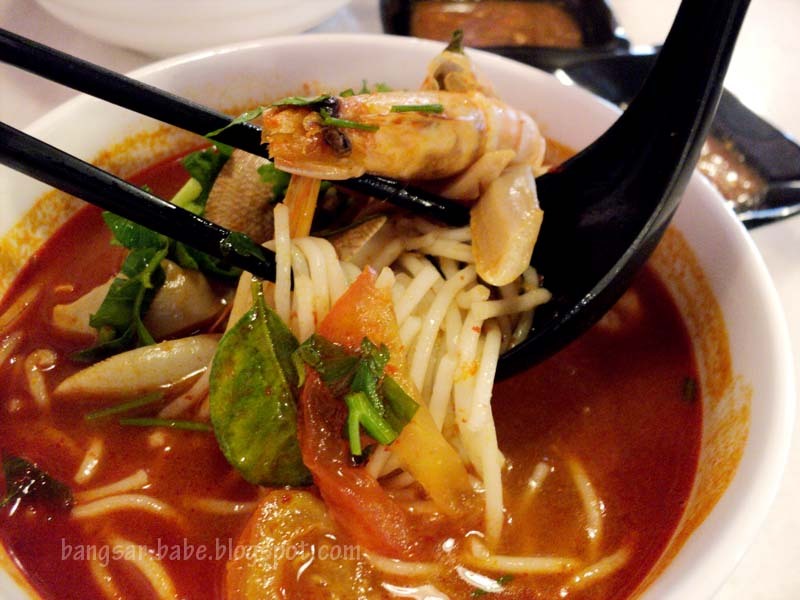 rif’s Seafood Tom Yam Noodles was just average. It wasn’t spicy or sour enough, and didn’t taste of any seafood. A bit of a letdown, we thought. That said, the seafood was reasonably fresh. The clams were plump, the prawn was sweet and the squid was springy yet tender. To cool down, we ordered the cendol (RM2.50), which didn’t look like cendol to me. 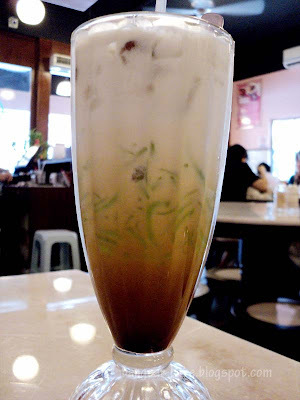 Instead of cendol with ice shavings, we got a cendol drink. It was alright, but I prefer my cendol the conventional way. Overall, the food was decent, but I wouldn’t say it’s good enough to go all out just to try it. If you happen to be around the area, give this place a shot. Or better still, come during the weekends. By then, you wouldn’t have to tear your hair out finding for parking spot. Oh, and according to rif, the toilet is clean. Verdict: Decent fish head noodles and it’s only 5 minutes away from my workplace. i wanna see if the boss is taller than gareth! oh this was the place my fren sang praises of! do they open at night? Just decent, hard to get good food nowadays yeah? Is the owner really 'gou'? LOL! For an outlet that specializes in both noodle items, they sure did not manage to please your tastebuds huh? sadly. Sounds like this place is worth a try. There is a pretty good FHN place at the food court near Damansara Specialist Hospital. 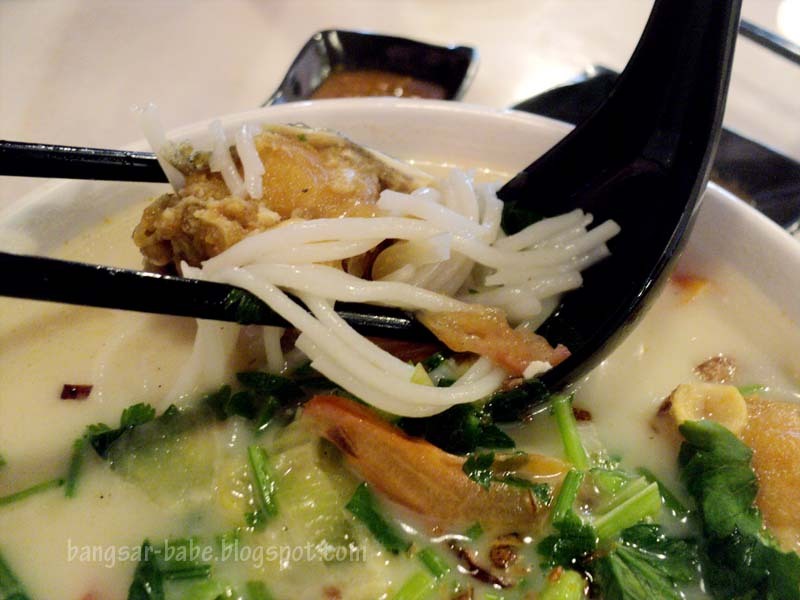 Bangsar Babe, I had Fish Head Noodles last night too! In Kuchai Lama. I would say the noodles were really decent! For me, it is utmost important that the fish used is fresh. TL – I always go to the FHN near Damansara Specialist Hospital. The Happy Garden one is a must try. But why so expensive?? 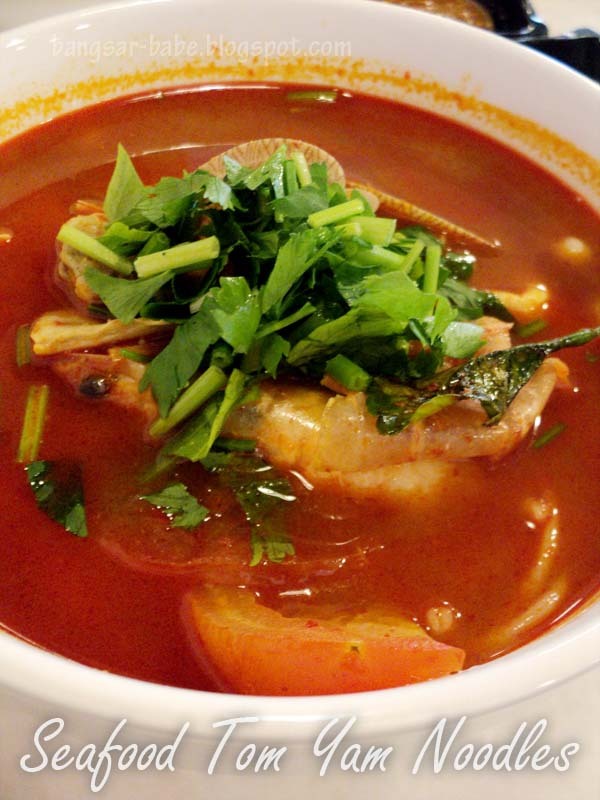 J2Kfm – Tom yam no lor…but the fish head noodles were quite decent. superwilson – I think we're spoilt for choices these days…so a bit hard to find something very very good. babe_kl – Yeah…they open till 10pm.